While Hurricane Irma raged outside, more than 20 women were giving birth at Sarasota Memorial Hospital. 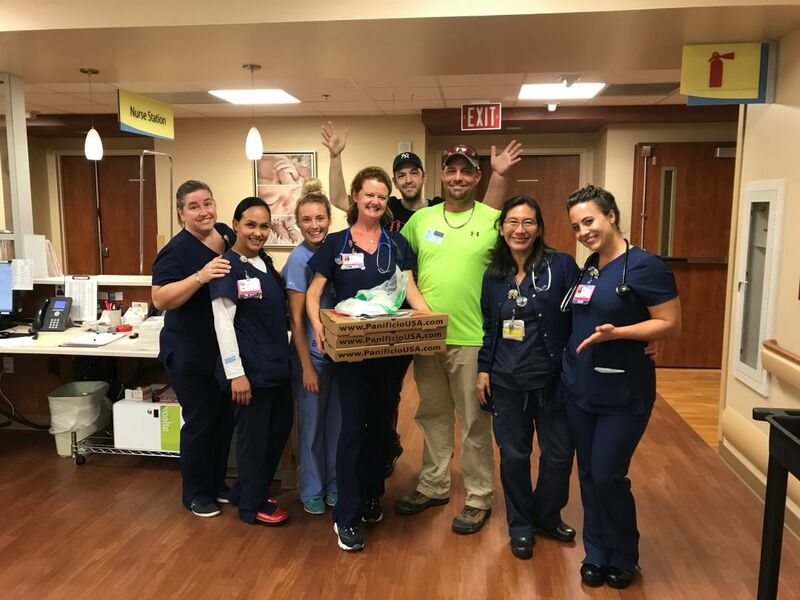 A father who had stayed in Sarasota Memorial Hospital's labor and delivery department a few weeks before Hurricane Irma brought pizza to nurses working there as the storm gathered strength. Dozens of local women this week not only dealt with the common stresses of Hurricane Irma—the chaos of evacuation, the anxiety of caring for family members, the uncertainty about whether one's home would survive. They also had a more urgent concern. As the storm swirled up Florida's west coast, they were going into labor. More than 20 women gave birth at Sarasota Memorial Hospital during Hurricane Irma. Luckily, they were in a safe place. The hospital's delivery unit is located inside its newish Courtyard Tower, built to be resilient during storms like Irma. The hospital went on lockdown at 7 p.m. on Saturday night. Nurses and physicians worked 12-hour shifts and slept on air mattresses inside the hospital during their downtime. Before the storm came, many pregnant women came to the hospital, anxious about the possibility of going into labor during the worst parts of the hurricane, when transportation to the hospital would be impossible. Physicians calmed nerves. They also visited shelters to reassure pregnant women worried about getting stuck there while in labor. All weekend, women kept coming in, up until early Sunday evening, when the winds were at their worst, says Judy Cavallaro, the clinical manager of the hospital's emergency obstetrics, labor and delivery and mother-baby units. "We had a full house, for sure," Cavallaro says. The mother-baby department has 30 rooms. With 32 patients, the staff had to use alcoves to house women and newborns who were ready to go home but unable to leave because of unsafe conditions outside. Inside, though, you would never have guessed it was stormy. "I didn't even hear anything," Cavallaro says. While babies were being born in the labor and delivery unit, the hospital's Neonatal Intensive Care Unit was caring for babies born as early as 24 weeks. Heather Graber, the clinical manager of the unit, says that thanks to clear communication and quality planning, things ran smoothly. "We had backups upon backups upon backups," she says. Graber met with parents staying with infants in the unit, as well as parents of infants being admitted to the unit, to explain how staff had prepared for storms like Irma. But that didn't eliminate all stress. "Many of our parents had a husband or partner who had to evacuate out of the area with their kids, and that created a lot of anxiety," Graber says. That goes for nurses and doctors, too. Many weren't able to keep in touch with their families. Graber says that's part of the job. "Our focus was on taking care of these babies," she says. Cavallaro says her staff had no "hesitation" about their work. While Irma didn't do nearly as much damage to the Sarasota area as many feared, the experience was intense. The mother-baby unit changes shifts at 6 a.m. and 6 p.m. During the 6 p.m. shift brief on Sunday, as Irma worked its way north, staffers came together to discuss patients and huddled in prayer. "It was really cathartic," Cavallaro says. "Some had left their families. Some families had evacuated to shelters. They were worried about their families and their community. They just let all that come out." When the lockdown lifted mid-morning on Monday, exhausted workers in the Neonatal Intensive Care Unit embraced before heading out to assess damage to their homes and to check in with friends and family. They felt relief that Irma wasn't as destructive as predicted, but also empowered at having made it through the chaos just fine. Stressful, yes, Graber says, but also, "It was a great bonding experience."